Tara worked in college access, admissions and advising for seven years at both Central Ohio Technical College (COTC) and Muskingum University prior to joining the staff in 2014. Tara holds a Bachelor of Arts degree in Hospitality Management from Eastern Michigan University and a Master's degree in Information Strategy, Systems and Technology from Muskingum University. In addition to overseeing the management of the staff, Tara lends her technical expertise to many facets of the organization, serves in leadership roles in the planning and assessment of the organization's programming and participates in direct programming at both the PEAK and high school levels. Jen joined A Call to College in the summer of 2016. She holds a Bachelor's Degree from Denison University in Economics and Sports Management and a Master’s Degree in Business Administration from Morehead State University. Prior to joining A Call to College, Jen spent 5 years with The Ohio State University at Newark in access and engagement, honors, and study abroad. Jen began her career as an AmeriCorps VISTA with Ohio State Newark and A Call to College and also coached softball at Morehead State University. Jen assists with both PEAK and High School programming. Shannon graduated from Florida State University in 1993 with a Bachelor of Science degree in English Education. She spent her early years working in the fields of human resources, training and communications. After leaving the workforce for several years to raise her two sons, Shannon began volunteering, substitute teaching and tutoring in the Newark City Schools where her children attend. Prior to joining the staff, she volunteered with the organization as an advisor and helped with the PEAK program. She assists with office operations, PEAK and high school programming. Sue joined A Call to College in the fall of 2011. She graduated from the University of Cincinnati in 1983 with a degree in Community/Health Services and Administration. While raising her four children, Sue was an avid volunteer in both the Granville school system and the local community. In 2004, she found a way to combine her two passions, children and education, by substitute teaching in the Granville schools. Sue oversees PEAK and assists with high school programming. Patty is a resident of Licking County for the past 24 years. She graduated from the University of Cincinnati as a finance major in the College of Business. She has had 2 careers. The first as a bank manager for State Savings Bank in Columbus. She most recently completed a 13 year career in financial aid as a financial aid counselor at OSU-Newark/COTC and then Franklin University. She enjoys outdoor activities - hiking, bicycling, gardening, and being near water. She also enjoys reading, crafting and hanging out with friends and family. Her career in higher education has given her a passion to help young people find their potential and to see that there is way forward to post-secondary education. Angelique joined A Call to College in June 2017. Prior to joining the organization, she worked at Central Ohio Technical College for five years as an access and retention specialist, advisor, events coordinator and adjunct faculty. One of her major COTC responsibilities was to plan, promote, coordinate and evaluate CollegeASPIRE -- hands on, faculty-led workshops that give under resourced community youth the opportunity to experience a college campus. She holds a Bachelor's Degree in Business Administration and a Master's Degree in Marketing and Communication from Franklin University. Julie is a 1983 Newark High School graduate who served as class president for three of her four years as a Wildcat. After receiving a Bachelor of Science degree in education from Miami (OH) University, Julie taught English first at Princeton High School in Cincinnati and then in the Newark district. Julie’s passion for education led her to become a member of the Par Excellence and Granville Christian Academy school boards and to homeschool her children. Prior to joining the staff where she assists with PEAK and high school programming, Julie volunteered with the organization in several capacities. Brett is a 1997 graduate of Newark High School and a recipient of the A Call To College Last Dollar Grant. In 2001, Brett earned his Bachelor of Arts in Classical Civilization from Ohio University in Athens. When asked what one does with a degree in Classics he quickly points out that his years of reading ancient Greek have aptly prepared him to interpret the Free Application for Federal Student Aid (FAFSA). Brett’s professional experience includes eight years as a Financial Aid Counselor at Denison University. He oversees Last Dollar Grant processing and the implementation of the ACT Now! program. 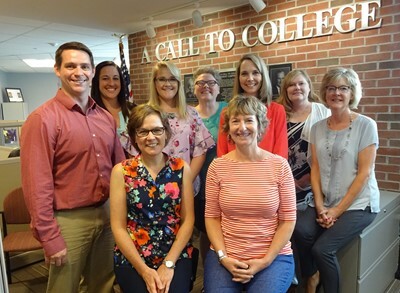 The 2018-19 staff: eager to start another great year!